Who is Django Reinhardt? What is a Gypsy Guitar? Gypsy Jazz? Jean-Baptiste "Django" Reinhardt (23 January 1910 – 16 May 1953) a Belgian Born Gypsy jazz guitarist. Left with only two fingers after an accident, he overcame handicap and adversity to become one of the most renowned jazz guitarists in the one hundred years history of the music form. With violinist Stéphane Grappelli he cofounded the Quintette du Hot Club de France. Reinhardt's compositions include such jazz standards as "Minor Swing", "Tears", "Belleville", "Djangology", "Swing '42" and "Nuages" (French for "Clouds"). "The Musette style waltz remains an important component in the Gypsy jazz repertoire. Reinhardt was noted for combining a dark, chromatic Gypsy flavor with the swing articulation of the period. This combination is critical to this style of jazz. In addition to this his approach continues to form the basis for contemporary Gypsy jazz guitar. Reinhardt's most famous group, the Quintette du Hot Club de France, also brought fame to jazz violinist Stéphane Grappelli. Gypsy jazz, along with traditional Gypsy music, is learned by the passing down of knowledge from older generations. Many Gypsy musicians do not read notated music. It is more common for beginners to spend hours learning and memorizing songs from recordings and gleaning techniques from more experienced players. In Gypsy jazz, guitar and violin are the main solo instruments, although clarinet and accordion are also common. The rhythm guitar is played using a distinct percussive technique, "la pompe", that essentially replaces the drums; however, in Eastern gypsy jazz, rhythm section is most likely covered by one or two cymbaloms, or (less frequently) a cymbalom and/or drums and an acoustic guitar (the cymbalom accompaniment technique is called in Romanian "ţiitură"). An upright bass fills out the ensembles. Although many instrumental lineups exist, a group including one lead guitar, violin, two rhythm guitars, and bass is often the norm." WHAT DOES A GYPSY GUITAR LOOK LIKE??? Note the oval shaped sound hole and oddly shaped bridge piece. "D" shape sound hole. This fret board extends slightly into the sound hole. The long fret board is used to reach into the upper octave range of the guitar. Two truly beautiful pieces side by side. Remember, Django was left with only two fingers after an accident. 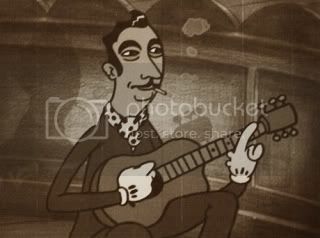 Note how this cartoon shows Django playing guitar with his two good fingers. How might the politically correct of today have dealt with this? Not nearly as well Django did...you better believe it!!! A little Django might do you some good. Click on the link below to hear some great Gypsy Jazz.